Resilience, according to most dictionaries, is defined as the ability of systems to rebound after severe disturbances, disasters, or other forms of extreme events. The definition applies usually to physical, spiritual, ecological, engineering, social, and political systems. Community disaster resilience is defined as the ability of social units (e.g., organizations, communities) to mitigate hazards, contain the effects of disasters when they occur, and carry out recovery activities in ways that minimize social disruption, and mitigate the effects of future extreme events. The objectives of enhancing disaster resilience are to minimize loss of life, injuries, and other economic losses; in short, to minimize any reduction in quality of life due to one or multiple hazards. Disaster resilience can be achieved by enhancing the ability of a community’s infrastructure (e.g., lifelines, structures) to perform during and after a severe disturbance. 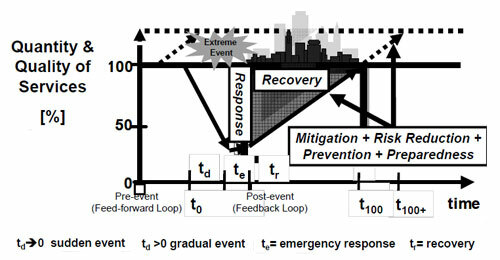 It can also be achieved through emergency response and strategies that effectively cope with and contain losses and through recovery strategies that enable communities to return to levels of predisaster functioning (or other acceptable levels) as rapidly as possible (Bruneau et al., 2003). Resilience is a function indicating the capability to sustain a level of functionality or performance for a given asset over a period defined as the control time TC (simulation start at t0). It is a non-stationary stochastic process, and each ensemble is a piecewise continuous function as shown in the figure above.